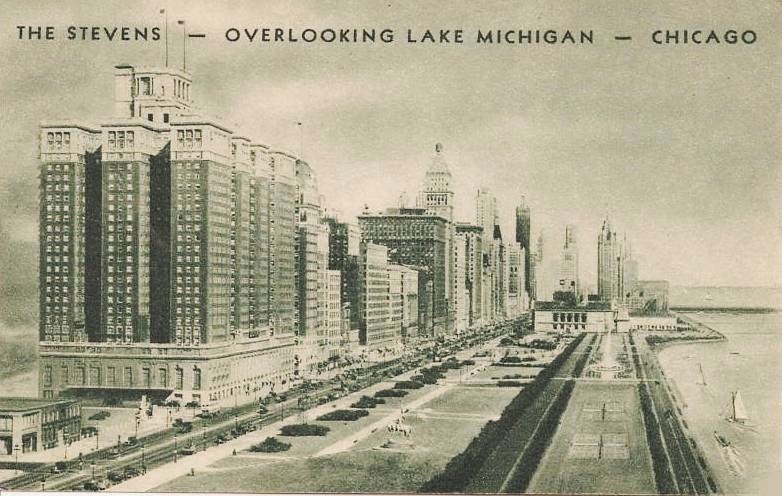 On this date, March 16, back in 1926 the cornerstone for the largest hotel the world had ever seen was placed as the vision of James W. Stevens began to rise across from Grant Park on Michigan Avenue. 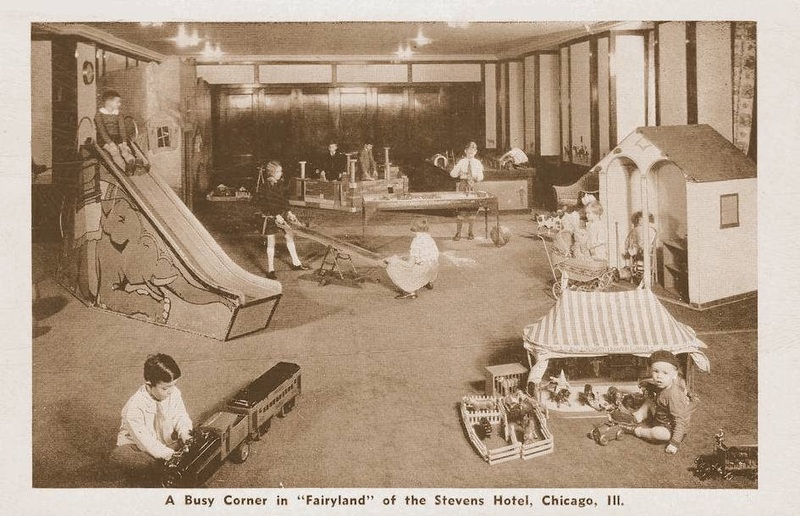 “J.W.” Stevens came to Chicago from Colchester, Illinois in 1886 and made a handsome sum in the insurance business. In 1909 he opened the La Salle Hotel at the corner of La Salle and Madison, which Ernest, his youngest son operated. It was Earnest, not the elder son, Raymond, who backed his father’s dream of building the biggest hotel in the world, a monumental palace that was projected to cost $28 million dollars, eight million bucks more than the New York City’s Chrysler Building cost at approximately the same time. The enterprise, we believe, will be of great value in maintaining and improving Chicago’s position as the country’s greatest convention center. Not only will it provide comfortable and convenient living quarters for many of the thousands of visitors brought here every month for conventions of various kinds but it will tend to attract more conventions and more visitors by its special provisions of adequate assembly rooms and dining rooms. Hotel accommodations are essential to a convention city; the more the better. Convention delegates bring money, stimulate trade, and carry the fame of Chicago to all parts of the country. Everything which can be done here to make their visits pleasant and profitable to them will be pleasant and profitable to the city. Superior hotel accommodations are an essential means to an end. The editorial from which that passage comes was buried in a copper box in the cornerstone ceremony. That same year old JW died of a stroke, and the eldest son, Raymond, shot himself to death in the library of his Highland Park mansion. Although initially convicted of embezzlement and sentenced to one to ten years in prison in 1933, Ernest, JW’s youngest son won an appeal a year later. But he had lost everything, The La Salle Hotel, Illinois Life, and the magnificent Stevens, which went into receivership. Today, of course it is the Hilton Hotel and Towers, holding only a little over half of its original 3,000 rooms. Back on March 16 of 1926, though, the future was as large as a man could expand his vision to imagine it. There on that morning between Seventh and Eighth Streets, J. W. Stevens, along with his sons, Raymond, who reluctantly endorsed the idea and ultimately died for it, and Ernest, who encouraged the plan and lost everything in its demise, stood together, joined by the architects John A. Holabird and Martin Roche.